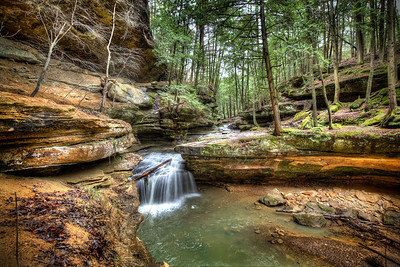 Here's another view of the Old Man's Cave area in southeastern Ohio. 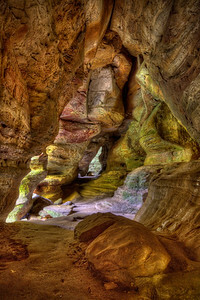 The river has eroded and formed the rock formations over millennia, creating the most beautiful colors and forms. 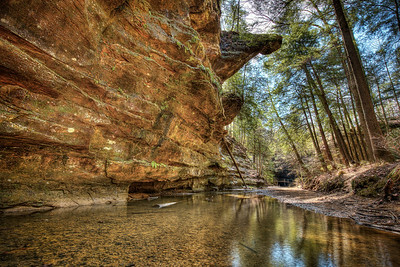 This is a view taken from the river that flows through the Old Man's Cave region in southeastern Ohio. 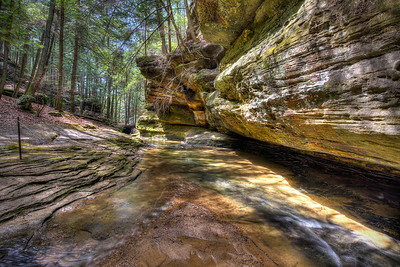 This particular image was captured while walking upstream from Old Man's Cave, heading towards the Upper Falls. 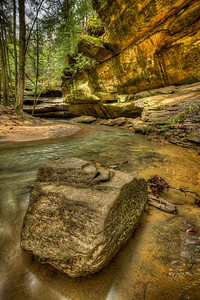 This is a view of the river than flows towards Old Man's Cave in the beautiful Hocking Hills in southeastern Ohio. 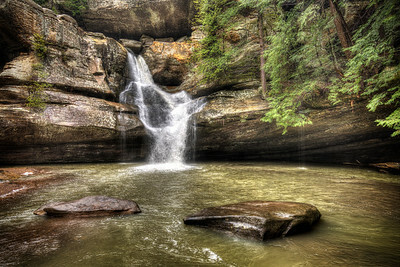 The whole area is filled with astonishing rock formations and crashing waterfalls. 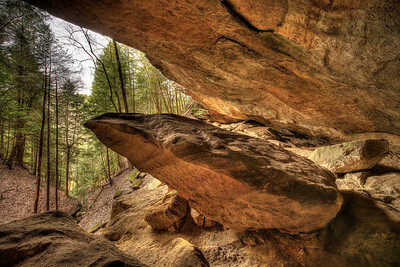 This is Ash Cave, my favorite of the numerous caves and outcroppings in the beautiful Hocking Hills area of Ohio. If you hear someone telling you that Ohio is flat and featureless, don't believe them! 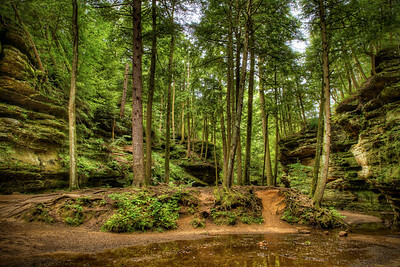 Southeastern Ohio is a wonderland of hills, waterfalls and fascinating geological features. 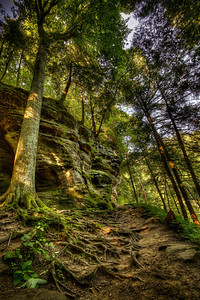 The Whispering Cave is found at the end of a new trail in the Hocking Hills State Park in southeastern Ohio. This newly accessible area and trail takes you past some of the most dramatic and colorful rock formations I have ever seen. I love how the light reflects into the cave to produce an amazing glow. 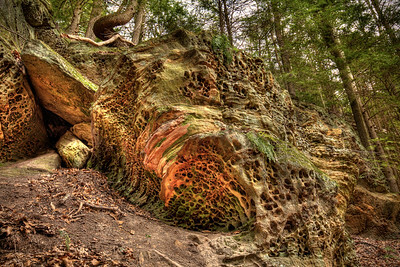 This is the appropriately named Honeycomb Weathering rock formation, found on the trail that leads to the newly opened Whispering Cave are of the Hocking Hills in southeastern Ohio. Just simple water erosion over millennia is all it takes.... Another outstanding example of the beauty of nature when she's left alone to work her magic. This is a view of Ash Cave, taken from within the cave and looking towards the far end, furthest from the trail that leads to the cave. 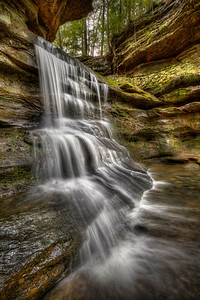 I love the cascading waterfall and how it catches the light, even on a cloudy day. In winter the flowing water builds a HUGE ice stalagmite that almost reaches the roof of the cave, more than 100 feet above your head. 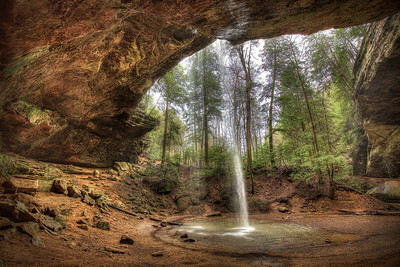 This is another view of Ash Cave, taken shortly after a heavy rainstorm moved through the area. This is a view of Ash Cave, taken from within the cave. Heavy rains always produce a spectacular flow of water over the lip of the cave roof. I love the cascading waterfall and how it catches the light, even on a cloudy day. In winter the flowing water builds a HUGE ice stalagmite that almost reaches the roof of the cave, more than 100 feet above your head. This is a view of Ash Cave, taken from within the cave and looking towards the trail that leads into the cave. 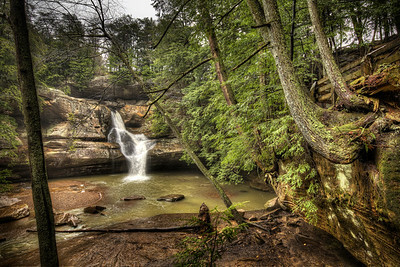 I love the cascading waterfall and how it catches the light, even on a cloudy day. I particularly like this image as it has a nice brightly clad person taking an image of the waterfall, drawing the eye and illustrating the scale of the cave. 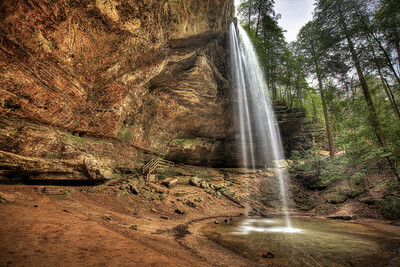 This is a view of the Ash Cave waterfall, taken from a particularly perilous rocky outcropping opposite the cave. I love the cascading waterfall and how it catches the light, even on a cloudy day. 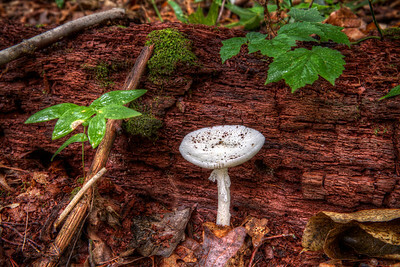 This is the color version of the monochrome image in this collection. This is a view of the Ash Cave waterfall, taken from a particularly perilous rocky outcropping opposite the cave. 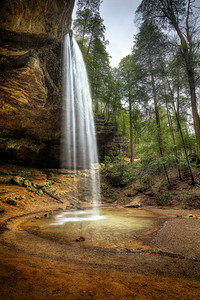 I love the cascading waterfall and how it catches the light, even on a cloudy day. 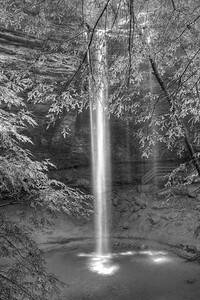 This monochrome version seems to glow with light caught in the needles of the surrounding pine trees, providing a nice frame for the cascading water. 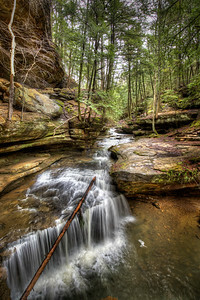 The little creek that flows out of the Old Man's Cave area in the Hocking Hills region of southeastern Ohio. 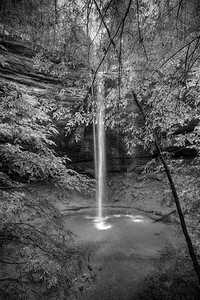 Cedar Falls, in the Hocking Hills of southeastern Ohio provides a dramatic view at the end of the trail that leads to the falls. 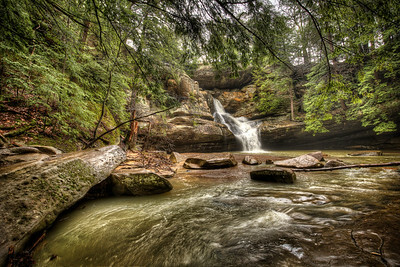 Cedar Falls, in the Hocking Hills of southeastern Ohio provides a dramatic view at the end of the trail that leads to the falls. The view here was taken from within the outflow from the falls. I love how the rain has emphasized the detail in all the rocks and how they contrast with the soft greens of the surrounding trees. 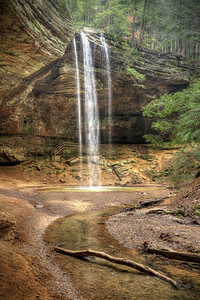 Cedar Falls, in the Hocking Hills of southeastern Ohio provides a dramatic view at the end of the trail that leads to the falls. The view here was taken from a rocky outcrop above the falls. I love how the rain has emphasized the detail in all the rocks and how they contrast with the soft greens of the surrounding trees. 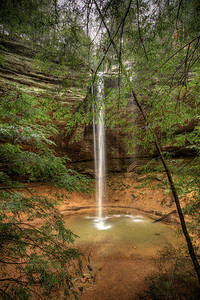 This is the Upper Falls at the top end of the Old Man's Cave area. 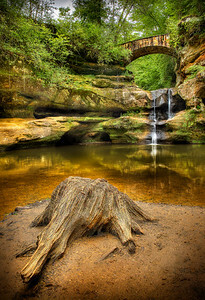 The image was taken at the end of the summer when the water levels were low. 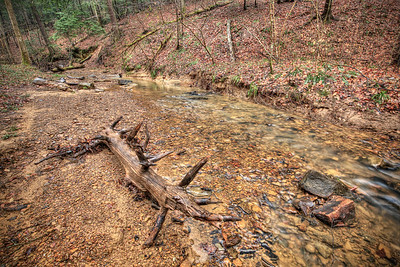 Heavy rains can make this a treacherous area to visit! But at quieter times of the year it makes a beautiful tranquil spot, full of birds and wildlife. 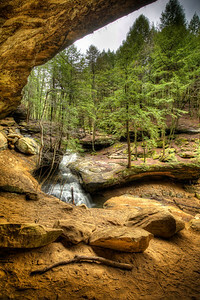 This is the view from Old Man's Cave in the Hocking Hills, southeastern Ohio. This area is a wonderland of tumbling waterfalls, spectacular cliffs, caves and rocky outcroppings, all teaming with wildlife. 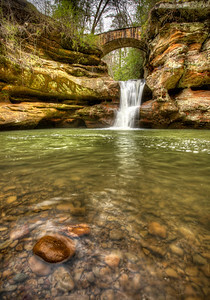 This is the view of the tumbling creek that runs through Old Man's Cave in the Hocking Hills region of southeastern Ohio. 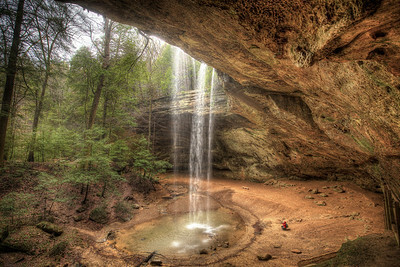 The main pool of Old Man's Cave is a magnate for wildlife and lovers of nature. The tumbling creek has eroded the surrounding landscape over millennia, forming wonderful ravines, caves, and rock sculptures. Mother Nature's best handwork. 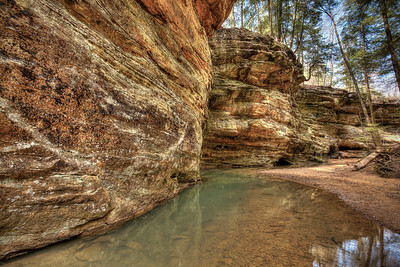 This is the only man-made addition to the Hocking Hills Old Man Cave. 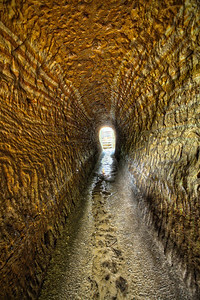 A (very) narrow tunnel has been carved out of the soft limestone to provide trail access through the Old Man Cave system. 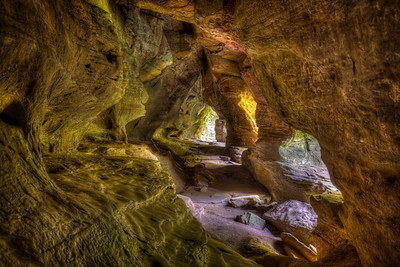 I love how the daylight from the far end of the tunnel captures and magnifies the colors and strata of the bedrock. 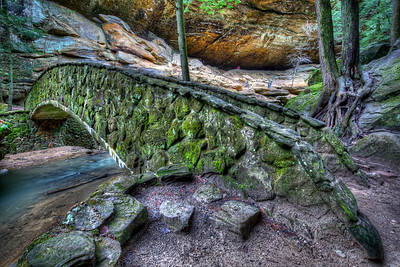 This beautiful stone bridge links the two sides of Old man's Cave in the Hocking Hills region of southeastern Ohio. 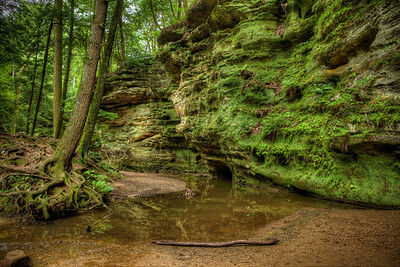 Spray and humidity from the creek and tumbling waterfalls provides an ideal environment for lush mosses and ferns.